Vegetation rooms are ideal for existing growers that already have a grow room and are looking to increase harvest times by growing younger plants to prepare for transplant and rotation into a flower room. The 4x4 Vegetation kit is the perfect option for growers looking to compliment a larger flowering room. This kit comes with all the essentials; lighting, fans, ventilation, carbon scrubbers, light timers, ducting, and many upgrade options. The only thing not included is soil or nutrients as many of our customers prefer to source soil and nutrients locally for reduced pricing. If you want a hydroponic veg kit check out the other hydroponic veg kits available on our grow tent kits main page. The K3-L600 Veg light from Kind LED is without a doubt the best veg LED on the market. Years of testing, research, and developement have produced an LED with a proprietary spectrum focused on vegetation that is capable of growing bushy plants with tight internodal spacing while reducing energy costs by nearly 50% from other lighting options and producing virtually no heat. Using this LED marvel in the Veg kit also removes one of the in-line fans from the equation, making a quieter and even lower energy consuming kit. Need/want a tent that is taller? No problem! 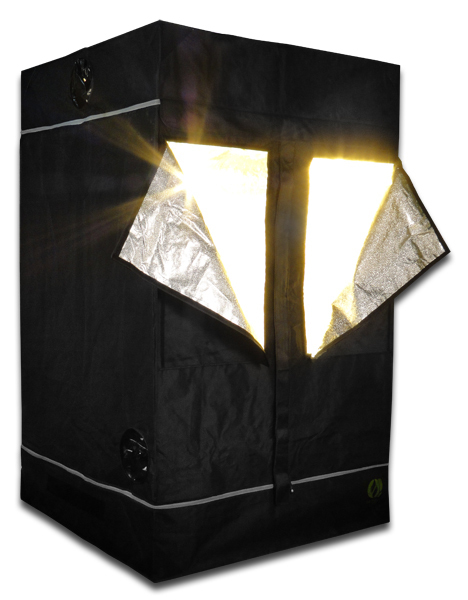 The 4'x4' Gorilla Grow Tent is height adjustable and can go from 6'11" high to 7'11" or ever 8'11". Need/want a tent that is smaller? No worries there either! Gorilla tents are also available in the shorty style to help growers that don't quite have the height they need for their tents. If you are starting from seeds or cuttings you may want to propogate them before they are ready for the vegetation tent. This upgrade gives you everything you'll need for growing those young plants up into adolesence.